The palettes are based on the originals. I'm open to suggestions if you feel like doing a quick palette edit and posting it. The C stays as it is the one I made for the CV3 title screen and I want them to match. The rest of the letters aren't final and I'm going to try to narrow the while thing so I can use the big sprocket holes from CV3, too. I should mention in case I haven't that I'm making 2 versions of this. And another for my old hack. Sorry, didn't even notice it was a custom C.
Palette was just one suggestion, though. Different emulator palettes aside, looking at these, in the original, letter weight, position, juxtoposition of colors, selected details… they all help the surprisingly strong color choice work. The text is primary, as it should be. In yours, many of your decisions have caused the red box to have drastically higher visual weight than the letters. Is... is there going to be an 8-bit rendition of "Singin' in the rain"? Shrinking the shield behind the title castlevania may help you keep your "C", but address the issues M-Tee mentioned. See the example below. I moved the Konami logo down some to maintain the symmetry. You may consider making the smaller letters of "astlevania" thicker/bolder. Thanks, those are some of the changes I'm planning. I'll have something new up soon. 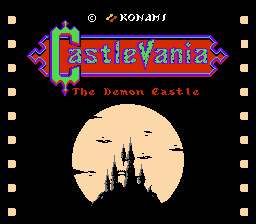 The new title screen for Castlevania is looking awesome! Reducing the size of the red could be part of a valid solution, yes. Be aware of tangents though, as Tater Bear's has three up top (the l, and both tips of the v). The moon and castle look great, though. Yeah, the red part is not going to be possible to shrink vertically because of the different palettes. May be the bottom row, but I can't have any of that blue in the big C either. 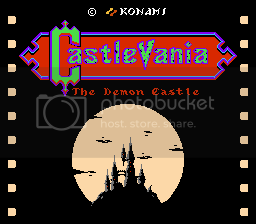 That castlevania title screen is pretty snazzy. Can't wait to see the hack behind it. It's not finished yet, the editor I'm using is buggy and incomplete. The orangy edges of the logo are supposed to move just like in the Japanese titlescreen, but I don't know how I'll do that. Also, I'd like to restore the original background. Hello. I am from Starmen.net. 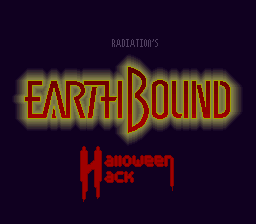 I made that Redone version of "Radiation's Earthbound Halloween Hack" and in it I used a custom title screen, but I do wonder if it looks like parts of it are a little off, mainly the "RADIATION'S" text at the top looking off-centered. What do you guys think? Yes. I do know MatPat used it. And it made me happy seeing it in one of his videos. 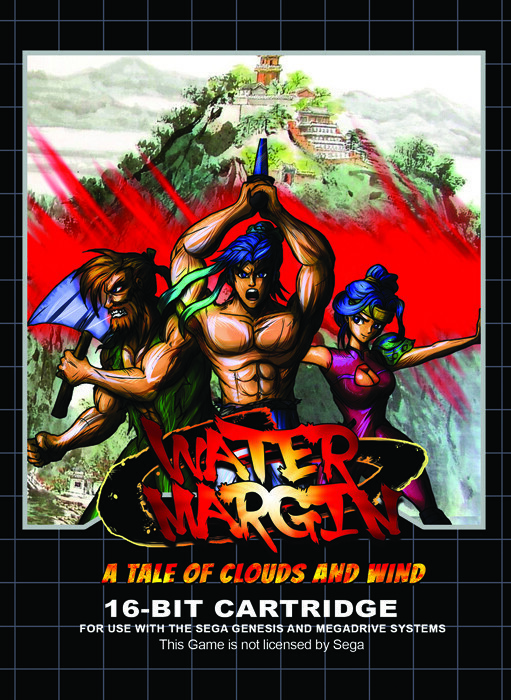 Looks like it was also released by SEREGA with much higher quality artwork and at a lower price. I won't dispute the artwork but in the case of price, are you comparing a legal release to a bootleg publication? That moon is going to become an oval on a real TV or on a minimally accurate emulator. The Nes generates a 256x240 picture but the NTSC signal will naturally distort the pixels to create a 4/3 image. That's why Kirby with square pixel is skinny and on a television is round. For the Kirby sprite and Chrono Trigger's earth, there are as much if not more circular sprites drawn circular in the game data and showing oval on TVs. And "minimally accurate emulators" (if the lowest standard you have is a post-processing suite as extensive as CRT Royale's TV filters) aren't that many. There's no "wrong" way to go about it really. Not to mention that many here aren't repro friendly for many reasons. Hi I really like the design of the castle, I think it gives an aesthetic of mystery is great, about the title I think you should work a little harder on to accompany this aesthetic so cool. I took the liberty to draw something, I have no idea if it exactly matches the size that you have to draw, it is only to better explain what I mean. I like the colors although I was trying to stick to the original palette more or less. I'll think about this possibility, thanks. I like that title you made. The colors blend well and it is more faithful to the western logo. I also think that Vanya want to simulate the style used in the first Castlevania title, this is a job is very difficult in itself because all lines must be solid and should place them dealing with the restrictions because the use of multiple pallets. This is a drawing done in first stay, plus I doubt that can be applied in the game the end result leaves much to be desired.